After more than ten-day enlightening trip in quake zone, I was quite impressed by fast and sound progress of building schools, hospitals, factories and residential places. Meanwhile, I was astonished that how little professional psychological counseling those traumatized minds, especially those hidden in sky-high mountains, have already obtained. Our volunteers, I think, have already offered “cultural recipe” for those kids who were frightened by falling stones, collapses, corpses and heart-torn cries. This, in some sense, is healing the kids need. However, the problem is that we could not stay long with them. And we could not help those all traumatized hearts. Kids need your help and love. Kids need your long-haul help and love. And those kids in the mountains urgently need your long-haul help and love. Tomorrow is a day of sorrow. And let us pray for those dead and let us help those survivors. This entry was posted on Monday, May 11th, 2009 at 11:32 am	and is filed under News. You can follow any responses to this entry through the RSS 2.0 feed. You can leave a response, or trackback from your own site. 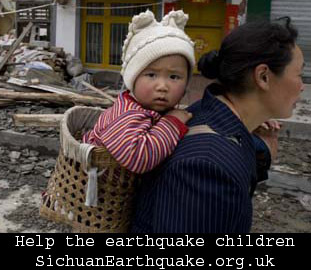 I would like to adopt an orphan from the Sichuan earthquake irregardless of age, gender, background or even just to provide financially for the child or teenager till adulthood in China. It’s nice headed for now finally locate a website where the blogger really knows what he is talking in relation to. Hey There. I found your blog using windows live messenger. This is the effectively published document. I am going to ensure that you book mark it accessible here we are at get more information of the helpful information. Information write-up. I’ll definitely comeback.